Pathogenic bacteria are increasingly becoming resistant to antibiotics. But they do have natural enemies: they can be killed by viruses that infect only bacteria, called bacteriophages, or phages. For nearly a century scientists have attempted to treat bacterial infections with whole phages. Rockefeller's Vincent Fischetti (1940- ) is the first, however, to focus on the deadly weapons produced by these viruses-potent and specific enzymes called lysins that chew lethal holes in bacterial cell walls. Fischetti and coworkers have identified lysins that can kill a wide range of Gram-positive pathogenic bacteria, and have proven their effectiveness in both preventing and treating infections in mice, an important step toward their potential application to human disease. Phages infect bacteria in order to reproduce. For a virus's progeny to get out of the cell, the phage directs the synthesis of an enzyme, lysin, that weakens the bacterial cell wall from the inside. Because of the high internal pressure of the bacterial cell (3-5 atm) it essentially explodes once the cell wall is eroded, releasing the new viruses to begin the cycle again. Unlike most antibiotics, which often kill a range of beneficial bacteria along with pathogens, lysins are specific to a bacterial species or subspecies: lysins from streptococcal phage kill certain streptococci, lysins from pneumococcal phage kill pneumococci, and so on. Lysins only are effective against Gram-positive bacteria, which have an exposed cell wall. Gram-negative bacteria have an outer membrane that protects them from lysins. Fischetti's laboratory has used recombinant techniques to artificially produce lysins that specifically attack some of the most widespread and deadly human pathogens-S. pyogenes, S. aureus, S. pneumoniae, E. fecalis, E. faecium, and group B streptococci-as well as a feared agent of biological warfare, B. anthracis. In a test tube, a few drops of lysin can kill tens of millions of bacteria within a few seconds. In mice, Fischetti and coworkers have shown, for example, that the appropriate lysin can quickly clear group A streptococci from the respiratory mucous membranes. Most human bacterial infections begin in the nose and throat from organisms that are carried there. If proven in clinical trials, lysins could be used not only to treat such infections, but also to remove disease bacteria in people who are carriers, and prevent or reduce serious infections among people in hospitals and nursing homes where antibiotic-resistant Gram-positive pathogens are common. Fischetti's group also has used lysins to successfully treat pneumococcal pneumonia, meningitis, endocarditis, and anthrax in mice, and to prevent secondary ear infections. Other studies in Fischetti's laboratory have shown that lysins can work synergistically in combination with other lysins or with antibiotics. Lysins in combination with antibiotics can kill bacteria that antibiotics cannot kill on their own. Ongoing research is designed to assess the safety and effectiveness of lysins in treating human infections. 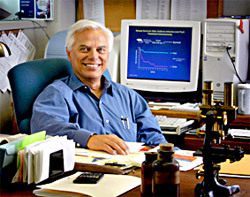 Vincent A. Fischetti received the BS in bacteriology from Wagner College (1962), the MS in microbiology from Long Island University (1967), and the PhD in microbiology from New York University (1970). He came to Rockefeller University as a postdoctoral fellow in 1970 and became assistant professor in 1973, associate professor in 1978, and professor in 1990. In 1987, Fischetti received a 10-year National Institutes of Health MERIT Award that was renewed in 1997. He was editor-in-chief of Infection and Immunity for 10 years and he is an editor of the authoritative text Gram-Positive Pathogens. Fischetti holds nearly 50 patents on the control of infections by Gram-positive bacteria.